On Friday April 14, 1865, Abraham Lincoln and his wife planned to go to Ford’s Theater in the evening. 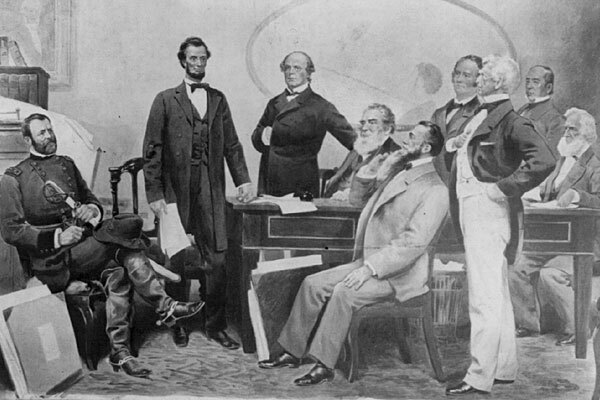 But first, Lincoln had a day of work ahead of him, which included a cabinet meeting. Inquiry had been made as to army news on the first meeting of the Cabinet, and especially if any information had been received from Sherman. None of the members had heard anything, and Stanton, who makes it a point to be late, and who has the telegraph in his Department, had not arrived. General Grant, who was present, said he was hourly expecting word. The President remarked it would, he had no doubt, come soon, and come favorably, for he had last night the usual dream which he had preceding nearly every great and important event of the War. Generally the news had been favorable which succeeded this dream, and the dream itself was always the same. I inquired what this remarkable dream could be. He said it related to your (my) element, the water; that he seemed to be in some singular, indescribable vessel, and that he was moving with great rapidity towards an indefinite shore; that he had this dream preceding Sumter, Bull Run, Antietam, Gettysburg, Stone River, Vicksburg, Wilmington, etc. General Grant said Stone River was certainly no victory, and he knew of no great results which followed from it. The President said however that might be, his dream preceded that fight.